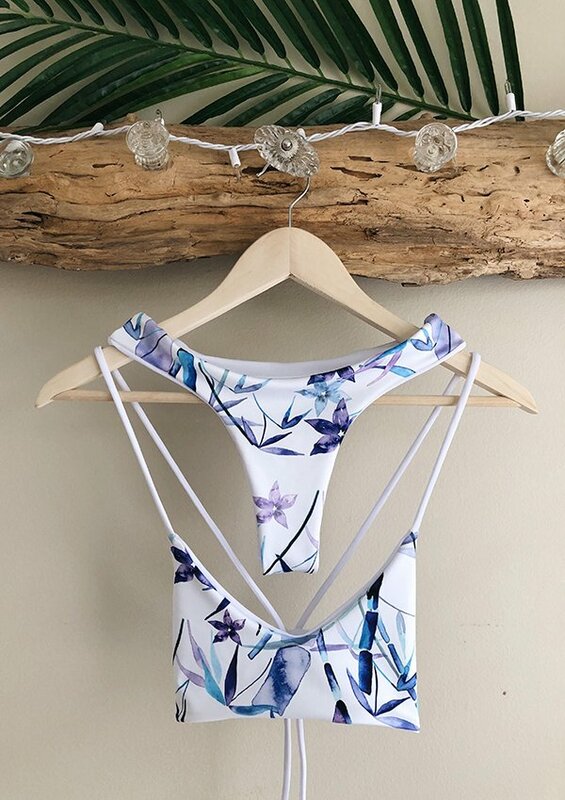 Designing abstract textural prints may seem like a challenge, but by selecting the Mirror Repeat Feature when using our Online Uploader, your designs can be taken to the next level with minimal fuss when it comes to repeating your design. 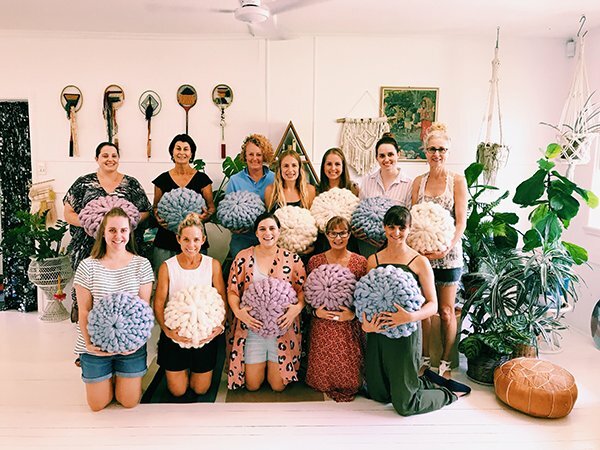 Here’s an easy to follow tutorial put together by one of our fabulous interns from 2018 – Emily! Firstly, start out by creating your own designs and then scan them into your computer. We recommend to scan your artwork at 300dpi and in RGB colour mode. 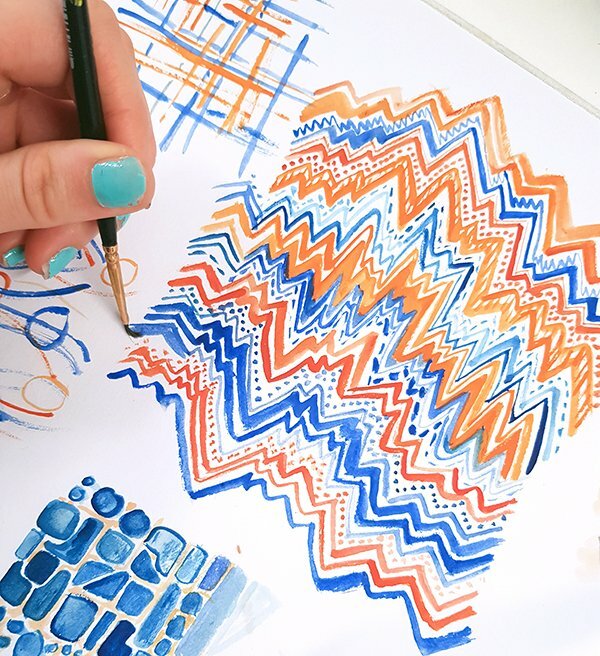 For our artwork we decided to play around with line-work and contrasting colours to create a high energy zig-zag effect. Open the design in Adobe Photoshop. 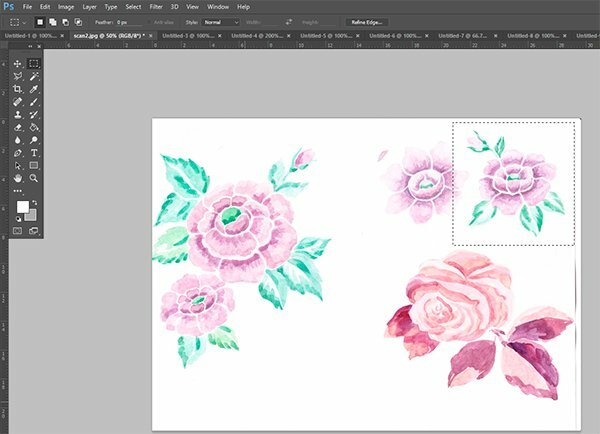 It’s at this stage that you can edit your artwork if it requires any tweaks, such as changing the colours or removing / cleaning up elements. 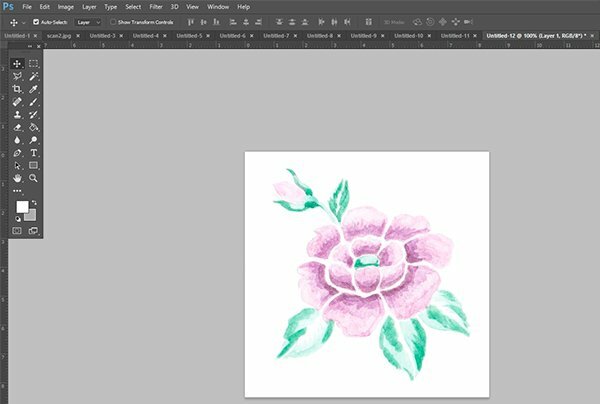 Once you are happy with your artwork use the crop tool to crop your design into a rectangular tile. Check the size of your image by selecting ‘Image’ > ‘Image Size’ from the menu bar in the top-left of your screen. If the dpi of your image is larger than 300, please reduce it to 300dpi. If the dpi of your image is less than 300 you can keep it at this size. 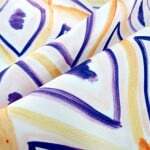 Please note we recommend artwork for digital printing to have a dpi of at least 150 for best results when printing onto fabric. Save the tile as a JPEG so that it is compatible with the Online Uploader. 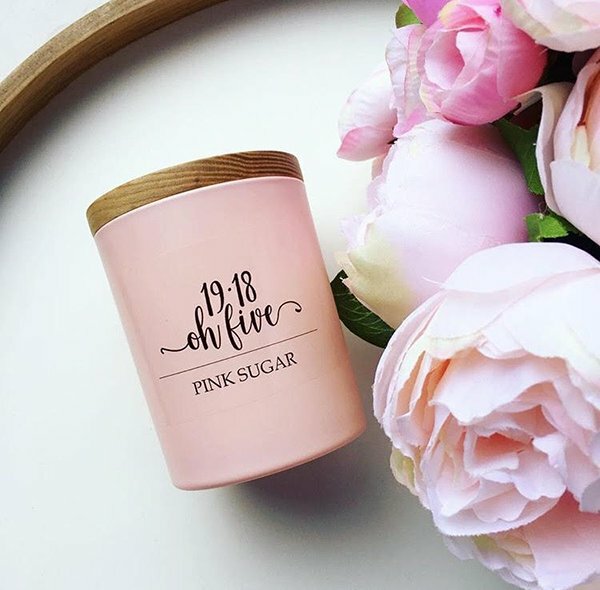 Next head to our website! The Online Uploader is available either clicking here or by copying & pasting this link: www.digitalfabrics.com.au/custom-fabric into your browser. 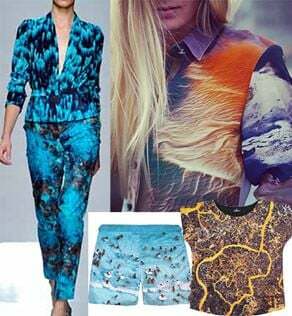 Use the Online Uploader to upload your design. 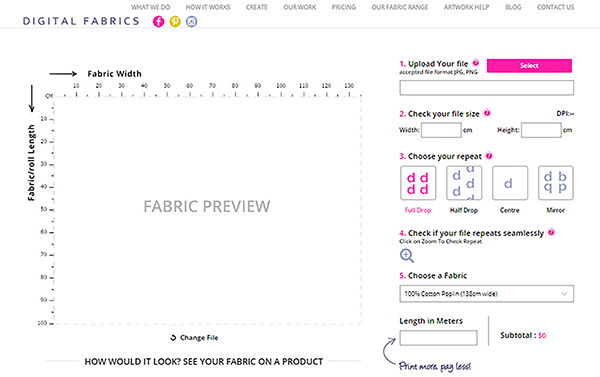 After the file has loaded you should see it in the fabric preview window. 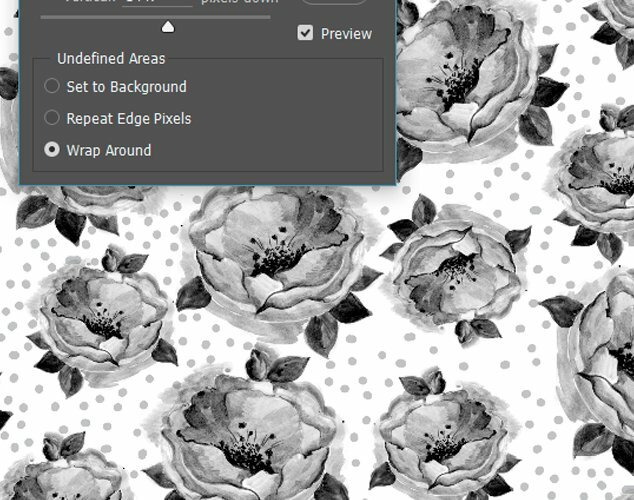 To the right of the fabric preview window you will see a list of options, including any changes that need to be made to your artwork size as well as the type of ‘repeat’ required for your design. When first uploaded your artwork will always be shown using a ‘full drop’ repeat. Select the ‘mirror repeat’ option. 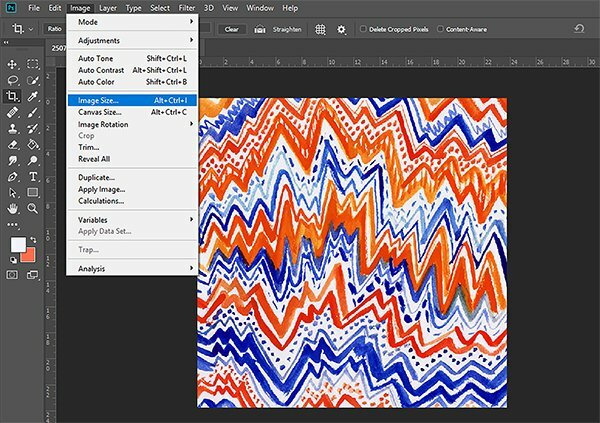 This will reflect your design tile’s edges when placed next to each other, resulting in a seamless repeat pattern of your textured artwork. Congratulations! 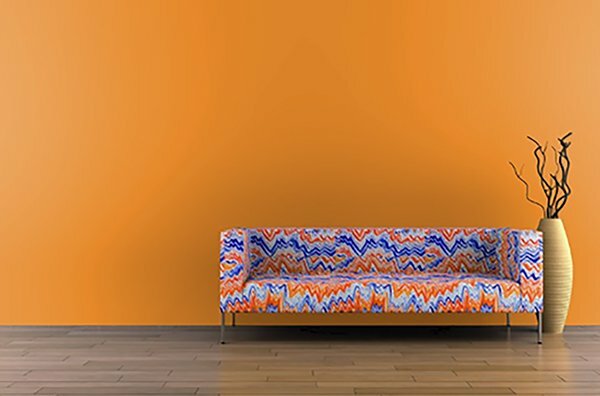 You now have a repeat design all set to be printed on the fabric of your choice and applied to any project you can imagine! 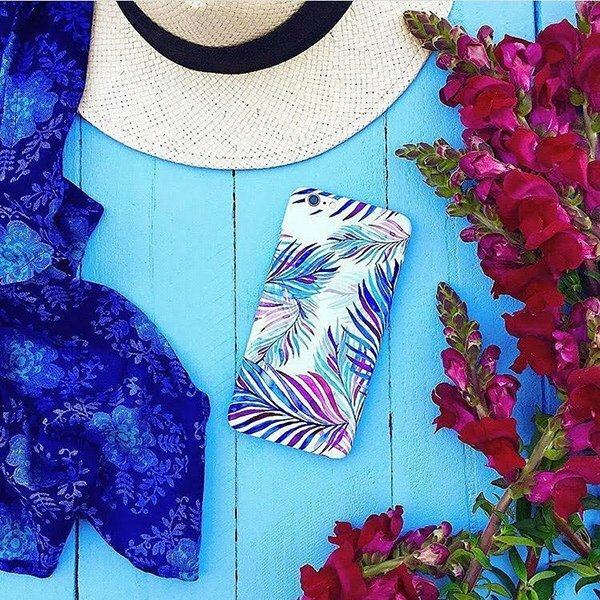 It would be safe to say that most of us are creative, we might love to doodle, paint, and create collages. 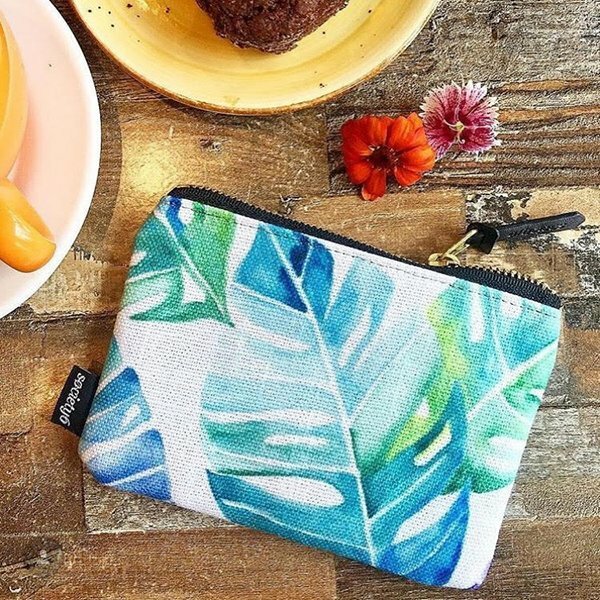 Whilst these are all wonderful and inventive practices, what if you wanted to start developing these crafts into textile designs but didn’t have the digital design software skills to get your file prepared for fabric printing. What we would say is “learn it’! 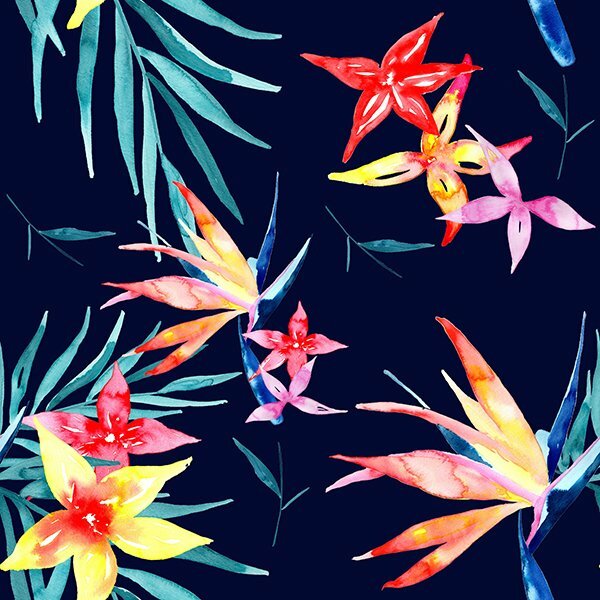 Learn digital textile design in small bites. 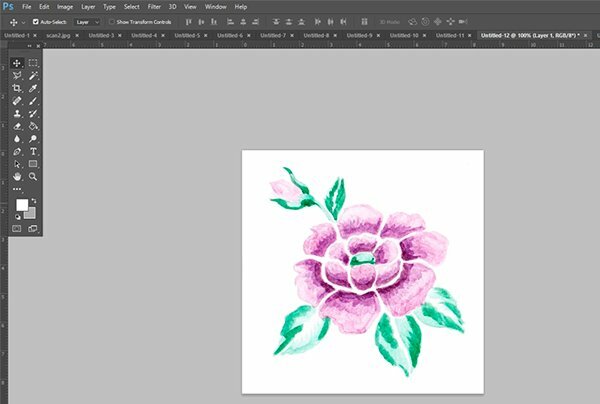 Start slowly, from converting your art into a digital format and getting to know basic Photoshop tools. 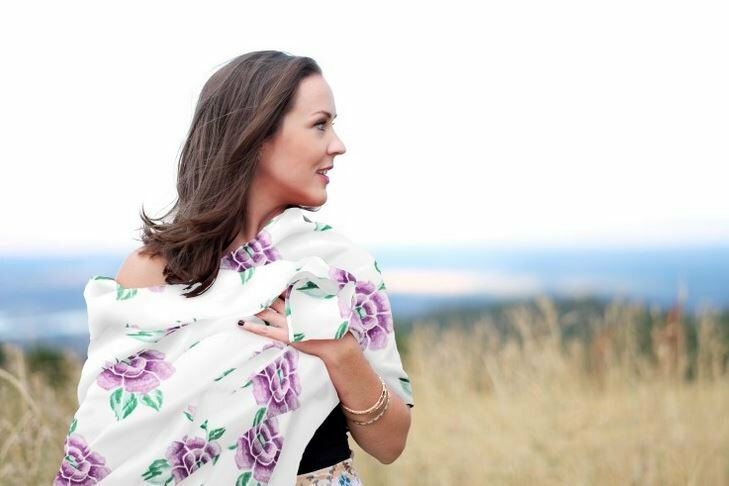 Everything new can be overwhelming, but if you take one step at a time and slowly build your confidence, you will get the hang of it in no time. 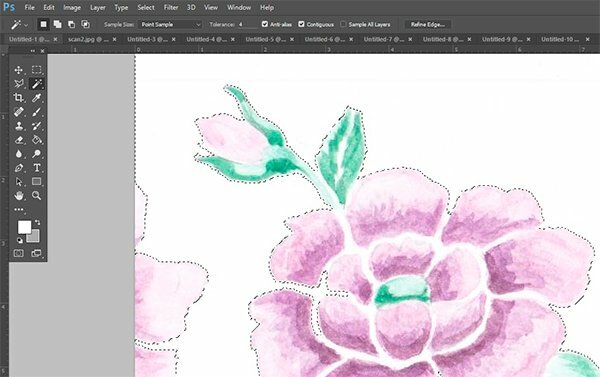 Below are some simple steps that will help you prepare your art for digital seamless repeat printing. 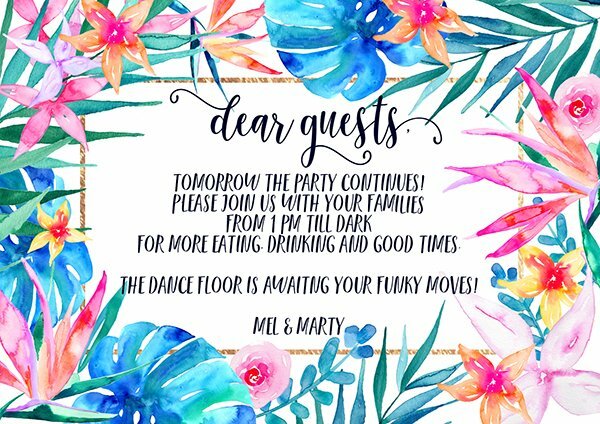 Start with an artwork painted onto a flat, one colour background that surrounds the artwork. 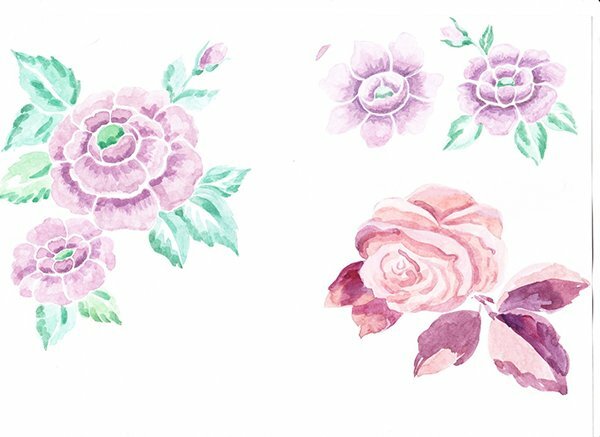 For this tutorial we used a simple white plain background for the purpose of being easy, but any colour is fine. 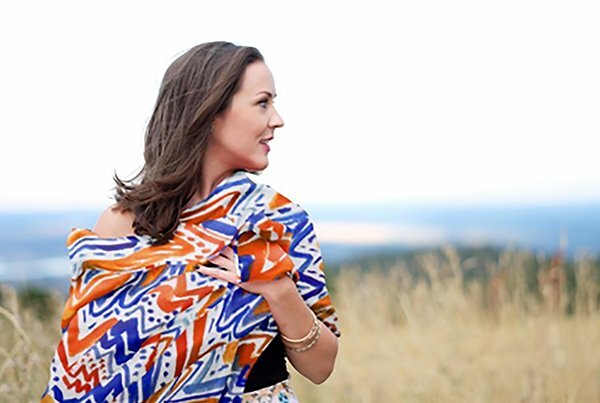 To convert your artwork into a digital format you need to scan or photograph the artwork. Scanning at a resolution of 300 dpi is preferred. However, if you don’t have a scanner, photograph your artwork laid out flat, indoors with plenty of light (natural day light if best), holding the camera directly above the artwork, making sure there are no shadows of any kind interfering with the artwork. 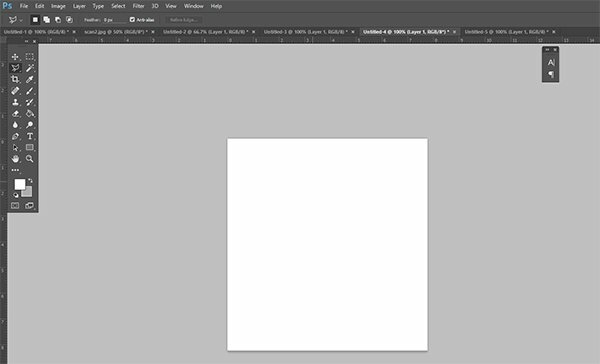 Open your artwork in Photoshop by selecting MAIN MENU > FILE > OPEN > CHOOSE YOUR ARTWORK FILE. Using MARQUEE TOOL select the object or image that you want to repeat. Now let’s bring the artwork or image that you want to repeat into a new document so you can start playing with it. While MARQUEE TOOL selection is active, (this will appear as ants running around the selected area) go to MAIN MENU > EDIT > COPY to copy selected area and FILE > NEW to open new document. NOTE: Photoshop is a very smart software. The area that you have selected will now determine the file size of the new document being opened. Click OK.
Whilst in the newly opened document select MAIN MENU > EDIT> PASTE to bring your selected artwork into the new document. It should paste by default in the middle of the new document fitting artwork well within the new document space. Nothing should be cropped out or hidden from view. Now to clean your artwork. 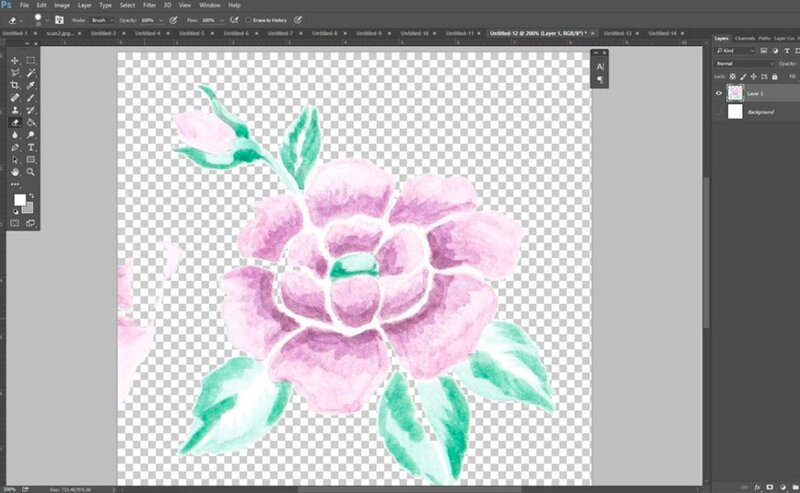 If your white background is slightly messy or the texture of the paper is visible, you will need to clean this up, since whatever you see on the screen will be printed onto fabric. To quickly ‘deep-etch’ or in other words ‘clean-up’, select the layer that you just brought in. Then select the MAGIC WAND TOOL. Change the tolerance to low (we selected a tolerance measure of ‘4’ but you might need to adjust this number as it is based on your artwork). 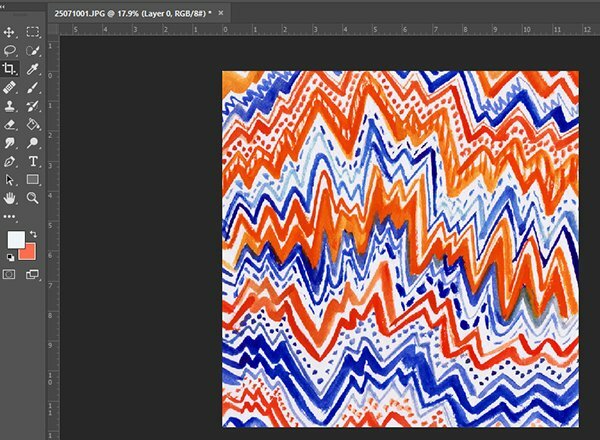 Tolerance is the rate at which the same or similar colours are selected when using the MAGIC WAND TOOL. The higher the tolerance the more of that colour will be found and therefore selected within the artwork. 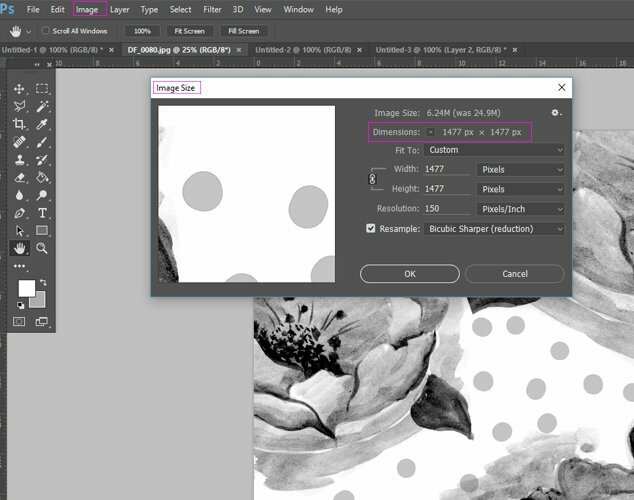 Make sure the CONTIGUOUS box is ticked, this will ensure that only space around your artwork is being selected, and not that which is inside or a part of the drawn objects. Now once everything is prepared for selection click on the white background to select it. You can see on the image below that only the white background area is selected. While it is selected hit the DELETE button on your keyboard. This will remove the white selected background. As you can see there is a little bit of another flower peaking through on the left side. Lets clean this up by using the simple ERASER TOOL. You can adjust the size of the eraser as needed at the top left of the screen. You can make the background layer invisible (this will then appear as little white and grey squares as seen below) to check that you have cleaned up all of the image. Simply zoom in to check the edges of your artwork and any potential unwanted marks left behind. The image is now clean, but colour wise the artwork is not strong enough. 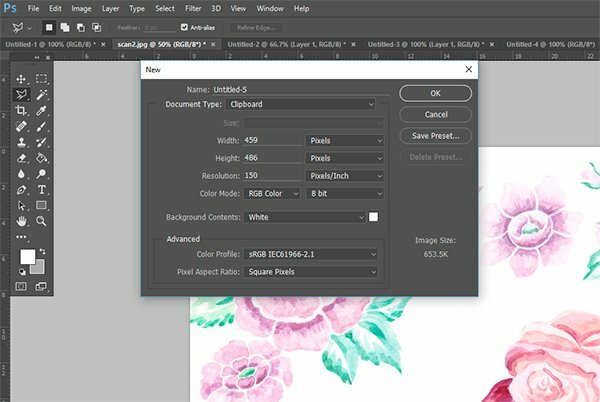 To brighten and intensify the colours of the image select MAIN MENU > IMAGE > AUTO CONTRAST. You are almost done! To flatten your image select MAIN MENU > LAYER > FLATTEN IMAGE. All layers have now merged into one. Save the image as a JPG high quality file MAIN MENU > FILE > SAVE AS > SAVE. 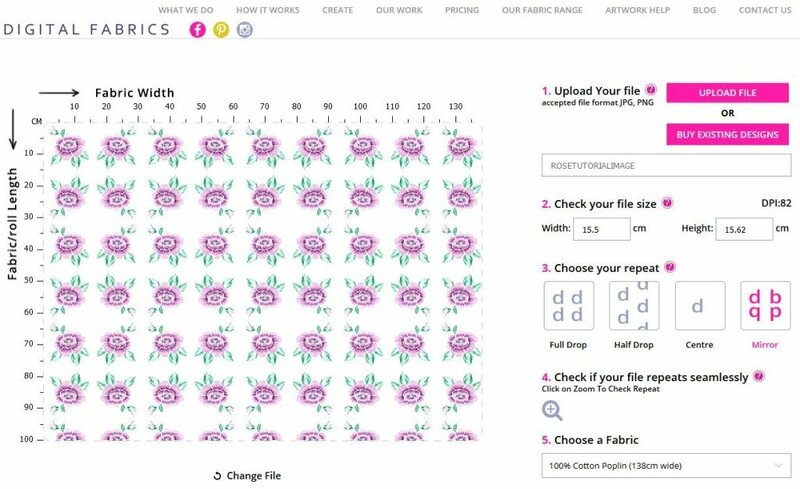 Now you are done and ready to upload your file to print on to a fabric of your choice! 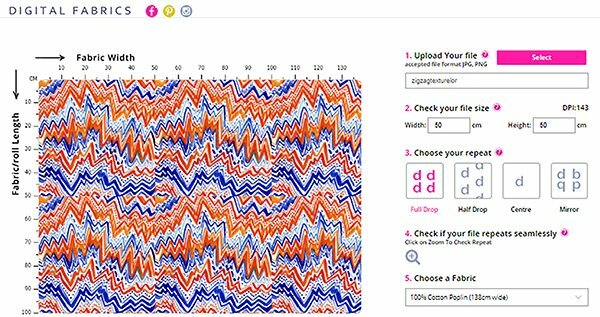 Open the Fabric Uploader page. 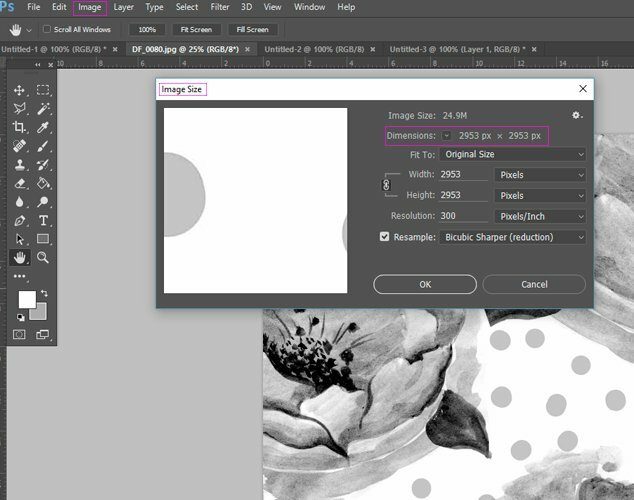 Drag & Drop your image or click on the SELECT button to upload your ready to print artwork. Once your file is uploaded, you’ll be able to see it in the fabric preview window. 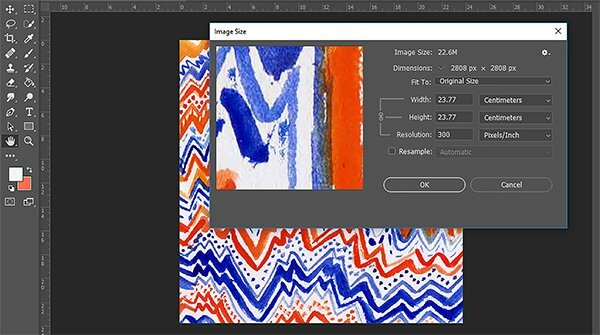 You can scale your artwork up or down, simply by typing in and adjusting the artwork to the size you want. Keep an eye on the DPI! This is the resolution and quality of your file. 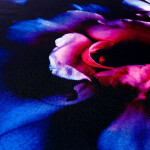 If your artwork is low resolution and is scaled up, the print result can be blurry. Next step is to choose your Repeat type. This is the fun part! 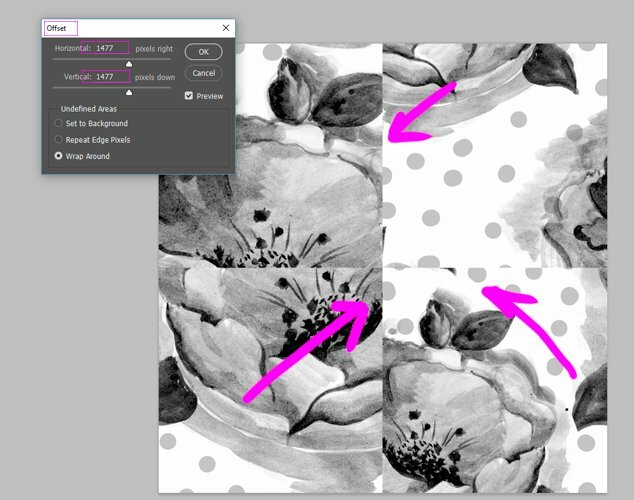 Play around with the different options and see how the variations impact your artwork in the preview window. 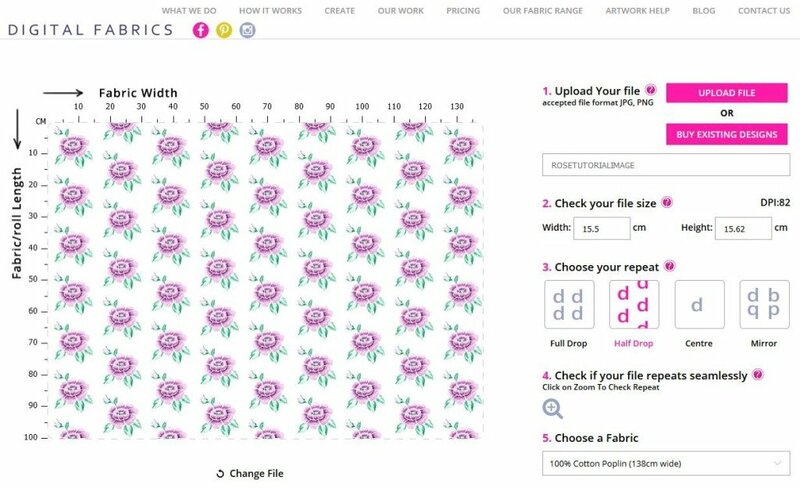 Compare how the different options distribute your artwork across the width and the length of the fabric. Pick the one that suits your design idea best! Choose how many meters you wish to print simply by typing it into the quantity box and then select the fabric you want to print on. 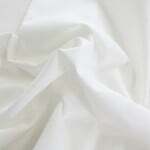 Remember that each fabric stock has a different width so be sure to check that the fabric you choose meets your needs. P.S. This tutorial is designed to be very basic. 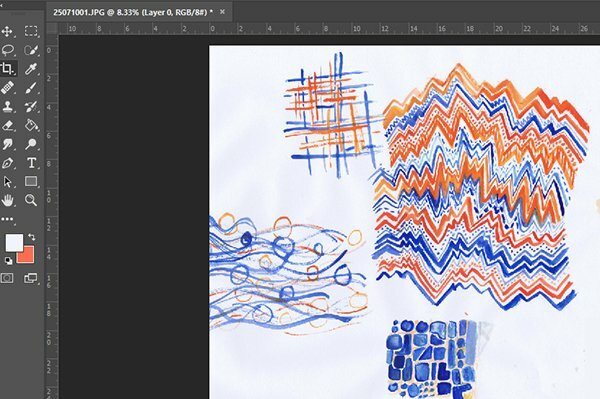 If you are still struggling to prepare your artwork files, we recommend you attend one of the workshops on offer at our Digital Textile Design School to help you nail those Photoshop basics! Check your artwork repeats seamlessly with Offset Filter in Photoshop. Check size of your image. Main menu > Image > Image size. Take note of the pixel dimension (PX) at the full resolution size. Change the resolution to half of its value and take note of the changed pixel dimension. Keep these numbers handy as you will need them to offset your artwork. Don’t click OK at this stage, as you don’t want to change the resolution size, you only need the pixel information. 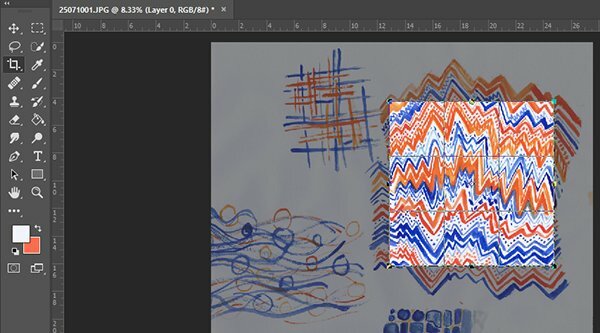 Once you have pixel dimensions noted you can offset and check your file for seamless repeat. Go to Main menu > Filter > Other > Offset. In the open box enter that half pixel values that you have noted down. Select option Wrap Around and tick the Preview option, so you can preview what is happening to your artwork. The side edges of the artwork will now be visible in the middle and the middle will become the sides. In other words the artworks sides got folded into the middle. 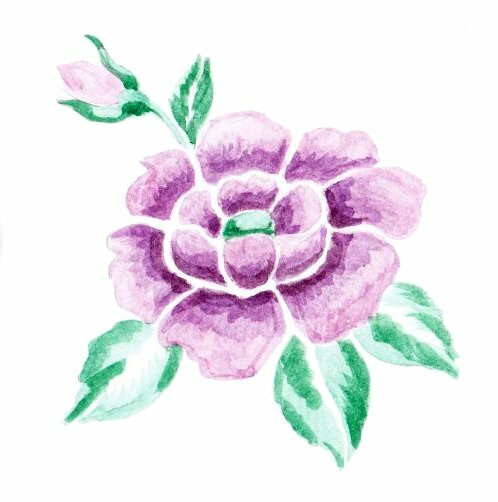 If your artwork in not in seamless repeat, you will see it in the middle of your artwork, through vertically and horizontally missed joins and miss matched lines. In some artwork this will not be obvious and you will need to zoom right in to the joining pixels to spot the issue. When your artwork repeats seamlessly, there is no miss matched lines and elements of the artwork flows seamlessly. 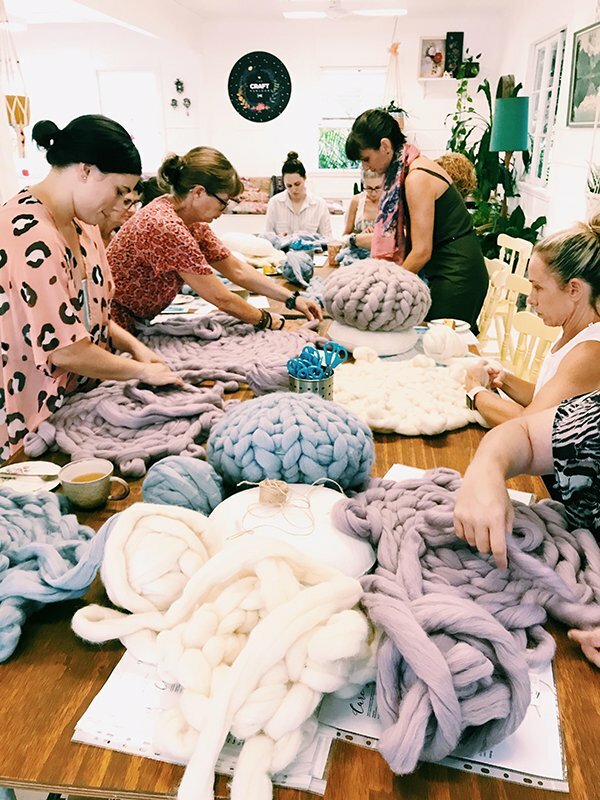 If you are at the beginning of your textile and surface design journey you might want to consider our workshops and classes on offer or continue learning more online through our available tutorials.